With the SLS, SOS, and STO functionalities, the SCHUNK EGN gripping system certified in accordance with DIN EN ISO 13849 enables safe human/machine collaboration. 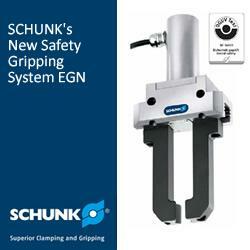 If the production process is interrupted by an emergency shut-off, the SCHUNK EGN goes into either a safely limited speed mode or a safe stop mode depending on the activated protection zone. In contrast to other solutions available on the market, the SCHUNK safety gripping system is continuously powered even in the safe operating stop so that the gripped parts are reliably held even without mechanical maintenance of gripping force. As soon as the protection zone is released, the gripper immediately switches back to the regular operating mode without the system having to be restarted.